As mentioned in the previous article, a new study published Monday, June 12, 2017 in the New England Journal of Medicine analyzed data from 68.5 million adults and children in 195 countries and found that 1/3 of people worldwide are overweight or obese and are at increased risk of chronic disease and death, as a result. In 2015, China had the highest incidence of obese children in the world (~10%) along with India. In 2015, China along with the US had the highest incidence of obese adults (>35%). I wanted to have a look at the Dietary Guidelines for Chinese Residents (Chinese: 中国居民膳食指南) in the years prior to 2015, to determine how they may have contributed to these high rates of overweight and obesity. 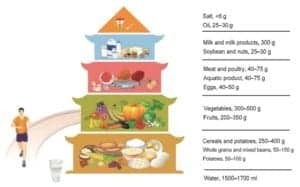 The Chinese Dietary Guidelines, known as the ‘Food Guide Pagoda’ was first published in 1989 and revised in 1997. The 2007 revision was developed in conjunction with a committee from the Chinese Nutrition Society, in association with the Ministry of Health. A new revision came out in 2016. The 2007 ‘Food Guide Pagoda’ (the one that was in effect at the time the 2015 overweight and obesity statistics came out) was divided into five levels of recommended consumption corresponding to the five Chinese food groups. According to the Chinese Dietary Recommendations, the majority of foods in each meal should be made up of cereals, including rice, corn, bread, noodles, crackers and tubers (such as potatoes), followed by Vegetables and Fruit. Meat, Poultry, Fish & Seafood and Eggs form the third level, and it is recommended that should be ‘eaten regularly’, but ‘in small quantities’. Milk & Dairy and Bean & Bean Products – form the fourth level. Fat, Oil and Salt – form the roof of the Pagoda and are recommended to be eaten in moderation. Eat a variety of foods, mainly cereals, including appropriate amounts of whole grains. Consume appropriate amounts of fish, poultry, eggs and lean meat. Divide the daily food intake among the three meals and choose suitable snacks. In 2015, heart disease overtook Chronic Obstructive Pulmonary Disease (COPD) as the second leading cause of death, followed by stroke. In 1990, the leading cause of death in China was Chronic Obstructive Pulmonary Disease (COPD) largely contributed to by smoking, followed by heart disease and diarrhea. In 2015 as in 2005, stroke was the leading cause of death, followed by heart disease. 3. 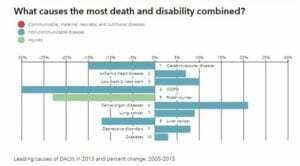 What caused the most death and disability combined? 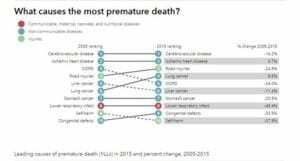 In 2015, stroke was leading cause of death in China, followed by heart disease. In 2015, for every 100,000 people in China, 2,237 people died from heart disease and 1,672 people died from stroke. In the US, for every 100,000 people, 457 people died from heart disease and 1,617 died from stroke. In Canada, for every 100,000 people, 327 people died from heart disease and 1,106 died from stroke. Rates of stroke in the China and US were quite similar. Both China and the US had the highest number of obese adults (>35%) in the world. 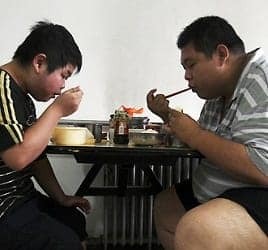 China concluded that “dietary risks drive the most death and disability” – especially stroke and heart disease which were the two leading causes of all forms of death, of premature death and of disability in 2015. 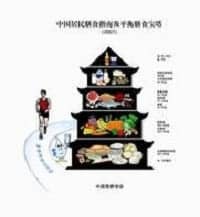 In response to these high rates of stroke and heart disease among Chinese, the Chinese government, with the assistance of the Chinese Nutrition Society produced a revised version of the Chinese Food Pagoda in 2016. Eat a variety of foods, with cereals as the staple – The daily amount of cereals and potatoes consumed for body energy production should be 250–400 g, including 50–150 g of whole grains and mixed beans, and 50–100 g of potatoes. The major characteristic of a balance diet pattern is to eat a variety of foods with cereals as the staple. Balance eating and exercise to maintain a healthy body weight – this is based on the same “calorie in / calorie out” model that the US and Canadian recommendations have been based on. “Avoiding ingesting excessive food and physical inactivity is the best way to maintain energy balance”. Consume plenty of vegetables, milk, and soybeans – The daily vegetable intake should be in the range of 300–500 g. Dark vegetables, including spinach, tomato, purple cabbage, pak choy, broccoli, and eggplant, should account for half this amount and should appear in every meal. Fruits should be consumed every day. The daily intake of fresh fruits, excluding fruit juice, should be between 200 and 350 g. A variety of dairy products, equivalent to 300 g of liquid milk, should be consumed per day. Bean products and nuts should be frequently eaten in an appropriate amount for energy and essential oils. Consume an appropriate amount of fish, poultry, eggs, and lean meat – The consumption of fish, poultry, eggs, and meat should be in moderation. The appropriate weekly intake is set at 280–525 g of fish, 280–525 g of poultry, and 280–350 g of eggs with an accumulated daily intake of 120–200 g on average. Fish and poultry should be chosen preferentially. The yolk should not be discarded when consuming eggs, and less fat and fewer smoked and cured meat products should be eaten. These “new” recommendations seem to be based on the same “calorie in / calorie out” model familiar to us in the West and that fail to take into account how the body compensates on a carbohydrate-based calorie restricted diet diet (see previous blogs). Over the last four decades, Americans and Canadians have reduced their fat consumption from ~40% in the 1970’s to ~30%, increased the amount of carbohydrate as whole grains, fruits and vegetables, are consuming low fat milk, eating more fish and drinking less pop and presently, 2/3 of adults considered overweight or obese. Should we expect different results in China? If you are looking to achieve a healthy body weight, lower blood sugar, blood pressure and triglycerides, I can help. I take a low carb high health fat approach and can teach you how to eat well, without weighing or measuring food, or counting “points”. Send me a note using the “Contact Us” form, on the tab above. Wang S, Lay S, Yu H, Shen S. Dietary Guidelines for Chinese Residents (2016): comments and comparisons. Journal of Zhejiang University Science B. 2016;17(9):649-656. doi:10.1631/jzus.B1600341.